The Blues swirled down the relegation pan to National 2 with another torpor display against an eager Musselburgh outfit at Beveridge Park last Saturday. There had been persistent rain all morning but the pitch looked in good condition when the visitors kicked off in a game which Kirkcaldy knew they had to win. The well placed kick dropped not far over the Kirkcaldy 10 metre line which should have been secured by the home team but the enthusiastic follow up by the visitors won the ball back. This preceded a three minute spell of Musselburgh offence which had the Blues' defence scurrying back. Even in these early stages Mussel burgh's pace about the field indicated a massive advantage. 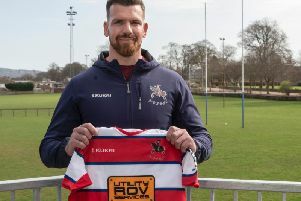 All season Kirkcaldy have struggled with the pace of National 1 rugby and this game finally brought home this deficiency. After a torrid start Kirkcaldy eventually caught up with a quickly taken free-kick. Centre Axle Black drove through and with support from Finlay Smith won a penalty in front of the posts kicked by the latter for a 3-0 Blues lead. Any encouragement from this score disappeared within a minute. A poorly struck clearance kick from a line-out following the re-start allowed Musselburgh winger Gregor Tait the easiest of run-ins for a try at the posts with Danny Owenson kicking the extras. Owenson added a penalty ten minutes later for a 10-3 Musselburgh lead. The Blues had possibly their best spell of the game around the half hour mark earning them a Dayle Turner try converted by Smith. Once more Musselburgh regained the ball from the re-start and forced the home team to concede a penalty kicked by Owenson which regained the lead for Musselburgh. While still in contention the Blues suffered a critical blow three minutes from half time when line-out talisman Connor Wood received a red card following retaliation after he had been tackled unfairly and unnoticed by the match officials. Wood is always at the heart of the Kirkcaldy effort and his dismissal rendered the Blues' chances of recovery virtually nil especially when Musselburgh added another try before the interval for a 20-10 half time lead. The Blues had a flicker of resistance at the start of the second half with an unconverted Smith try. This resistance gradually faded as the pacy Musselburgh back line swung into action exposing Kirkcaldy shortcomings. No soon had full back James Ferguson touched down than a bad bounce completely deceived home full back Craig Letham for Tait to race away to put the outcome well beyond doubt. The momentum was now completely with the Midlothian team who dominated every aspect of the game with a hat-trick try from Tait and a runaway effort from flanker Michael Maltman. At 44-15 behind Kirkcaldy's day was done and although there were late tries from Turner and Timmy Kennedy which earned a hapless bonus point, exactly a year on from the date Kirkcaldy gained promotion from National 2, they returned there unceremoniously. Kirkcaldy had many brave efforts during the season but clearly failed to reach the required standards of National 1. They never came to terms with the pace and power of the higher league with a pool of players which was clearly not big enough to cope with the injuries sustained. How they will fare on return to National 2 against a host of ambitious clubs remains to be seen. Kirkcaldy: C Letham A Brooks, C Littlejohn, A Black, T Kennedy, F Smith, G McKenzie, G Queen, J Pow, M Salt, C Wood, J Ramsay, S Evans, C Wilson, M Harvey. Replacements: D Jennings, C Hamilton, R Brown, D Turner S Anderson. Fife Trophy Centre Star Check: 3 Jacob Ramsay, 2 Dayle Turner, 1 Alex Black. Final standings: 21 Josh Laird (winner); 17 Struan Robertson; 14 Connor Wood; 11 Dayle Turner; 10 Rhys Bonner, Jacob Ramsay; 9 Alex Black; 7 Michael Harper, Jack Pow; 6 Matthew Harvey, Finlay Smith; 3 Greg Wallace, Conar Littlejohn, Iain Gillies, Timmy Kennedy, Marcus Salt; 2 Owen Bonner, Craig Letham; 1 Jack Denton, Craig Hamilton.